Women mostly, but men as well, have one great problem, which can significantly impair physical appearance and that is cellulite. Do not think that this issue is only seen among those who are obese or have weight problems. Cellulite can be developed on skinny and normal weight people. We have said that women have the most problems with cellulite and in numbers, 90% of women on this planet have cellulite. This would mean that just one out of ten women is free of cellulite. You can see that this is a really common problem, but it can be eliminated and corrected so that you get to the small number of lucky ones. The ration between those women who have cellulite and those who do not have it can be made more balanced if women try to correct this problem or eliminate it. By reducing the percentage of those with cellulite from 90 to 85, we will increase the number of cellulite free women to 15. The problem can be made less common if we start doing something about it. When dimples are located on the face, most people will say that they look very nice and adorable, but this is something that will not happen if they are on the hips, thighs or other location prone to cellulite. 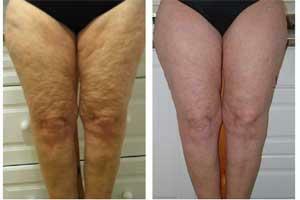 Cellulite is a problem that mostly targets women and for them, physical appearance is very important. This is why we have so many products for elimination of cellulite, but not all of them are effective and it is hard to find something that will really help with the cellulite issue. Unfortunately, most of these products are inefficient and you will waste a lot of money on them because they will never provide the effects advertised on the TV. But do not think that there is no solution for this problem. Liposuction is an option, but we are sure that the majority would like to skip this unpleasantness. So what can you do? Areas where cellulite is located need to be the target of exercises and nutrition has to be proper and healthy. Balanced diet will remove fatty tissue and toxins from the body, which causes the cellulite. Elimination of cellulite can be aided with the saunas and massages. Toxins are eliminated with the help of water, so drink from 6 to 8 glasses every day. Men do not know what cellulite is since they cannot have it due to the different structure of the fat deposits. Anyone have good suggestions for dealing with cellulite?